Oakwood Transport is a medium sized, family owned transportation company that has been in business since 1993. More important perhaps, is that the family has been involved in trucking since 1969. The larger Oakwood "family" includes both professional company drivers and top-notch owner operators, each with years of experience, especially in cross-border shipments and each one knowing that the reputation of the company rests on excellent service. Oakwood is a Canada and US Customs bonded carrier, ACE compliant and a C-TPAT certified partner. 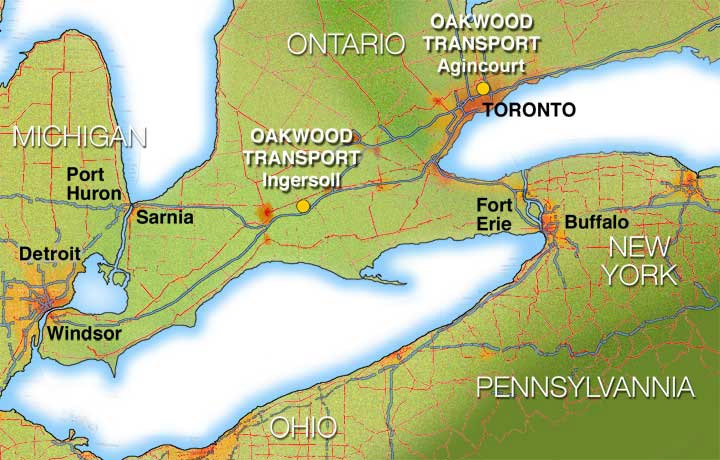 Our terminal is located at 129 Oakwood Street in Ingersoll, Ontario, just off Highway 401. This location provides easy access to Toronto, Montreal and Quebec City and the border points at Windsor, Sarnia, Queenston and Fort Erie. The terminal provides modern service facilities as well as custom fabricating and retrofitting facilities for automotive carriers. Like all good families, we keep in touch. Every truck is equipped with a mobile wireless and email solution (PDA) to provide constant two-way communication between dispatch and driver and 'real time' tracking of every shipment. Once again, service is our product.